BEST TIME TO VISIT: Anytime. COMMENTS: East of Bakersfield in the El Paso Mountains. Listed in "Ripley's believe it or not" the site of a man's quest to dig thru an entire mountain! UPDATE: This town is currently on private property and therefore you cannot walk around in it. REMAINS: Tunnel, tailings, some structures. The southern California deserts can be very inhospitable. And indeed they were to Eugene Garlock who built the first mill to process ore hauled down from the Randsburg mines. 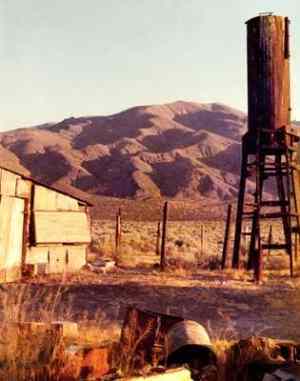 The scarcity of water was always a problem for the miners as well as those who operated the mill. The first mill was called the Garlock Pioneer Mill and was soon followed by five more to take care of the increasing amount of ore. There were only a few buildings in Garlock but it did have a school, which doubled as a church, and meeting place for the Garlock Literary Society, which was, considered a positive influence on the town's morals. Garlock lasted until 1903 when the last residents moved away. 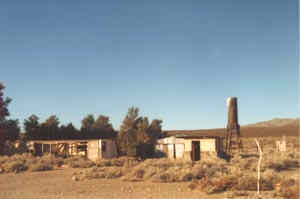 Several weathered buildings are all that is left of Garlock plus a well-preserved contraption once used to crush ore. Submitted by Henry Chenoweth. 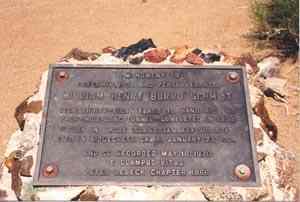 An interesting miner known as Burro Schmidt mined the Garlock area to the point while he was following a vane he actually popped out of the other side of a mountain. 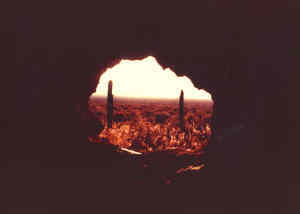 The tunnel blasted out of solid rock has a few side passages that dead end. But sure enough if you follow the light you will imerge plum on the opposite side of the mountain where you started. 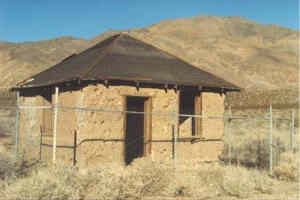 You can find the tunnel in the vacinity of the Garlock shortcut to Ridgecrest Ca. At times I believe short tours may still be available of this engineering marvel (of sorts!). Submitted by Skip Robinson. 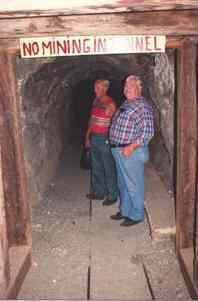 I submitted the original comments (Skip Robinson) when Burro's tunnel was included in the Garlock, Ca. text and recently visited the site once again 25 years later in April 2007. 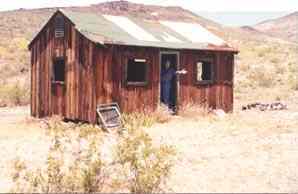 The tunnel site stills exists 7 miles into the hilly, desert interior adjacent Garlock , Ca. The dirt road (poorly marked) does have a sign "Schmidt Tunnel". Additional signs pop up during your journey on the dirt road. Although I accomplished the treck in a F150 2W with off road tires I recommend a 4 wheel drive and bring water. You will pass by numerous mine sites along the road. Minerals abound as do reptiles during the hot season. Upon arriving at the tunnel area there are two structures in severe deterioration yet still standing. 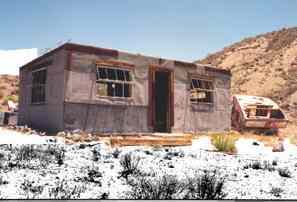 Those represent Mr. Scmidt's shack and that of a past settler who has passed away over the last ten years or so. A preservation group has made an attempt to limit damage at the sites with minimal preservation signage. 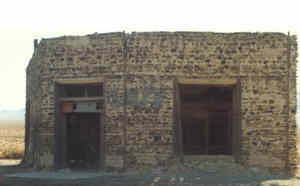 The site is abandoned. Upon approaching the tunnel you will find tracks and ties still in the mine. 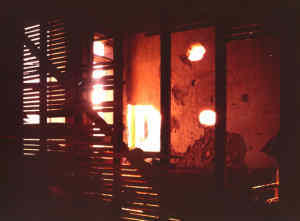 A hardrock mine, it is safe to explore but two flashlights are advised. The tunnel is still clear and emerges on the other side of the moutntain with an incredible view of the El Paso mountains and a dry lake bed. The tunnel itself has a intersecting tunnel about a quarter of your journey thru where it is rumored "Burro" used to duck into when detenating dynamite charges. This saved money on fuses! It is also said he was hospitalized for miscalculating one time or more. Supposidly there is a "lost chandalier room" within the tunnel where he actually had some elaborate chandalers hanging. 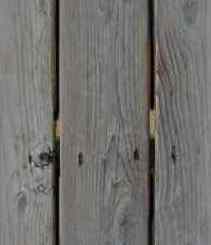 It has never been found and it is hard to imagine where it could be hidden. His ghost has been said to be seen in the area also and after really digesting this incredible feat of manpower you have to wonder if maybe it could also be true. As you reach the near end of the tunnel the shaft forks both left and right. Go to the right and emerge into the sunlight and the vista. Go le! he tunneel will eventually come to a turn to the right and then dwindle to an eventual end. You will find as your journey comes to an end the tunnel gets smaller and smaller. Why, it seems "Burro" became increasingly bent over with old age and the tunnel became smaller. 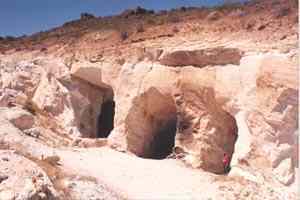 It was said "Burro" dug the tunnel to make an expedited route to milling and commerce sites but from the look of the tunnel on the inside and those areas excavated adjacent quartz veins I believe he chased an ellusive fortune hidden withing the mountain. 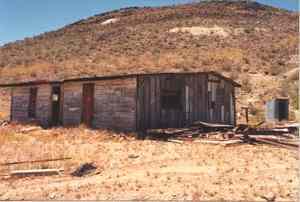 "Burro" had many claims in the locality and upon passing a substancial amount of gold was found in one of his other mining shacks elsewhere in the region. Exactly where it was from we probably will never know . We do know for sure there was and is gold in the area. 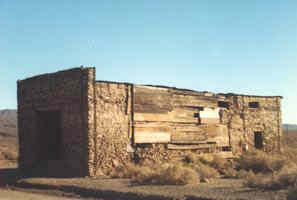 Bonanza Gulch Post office. 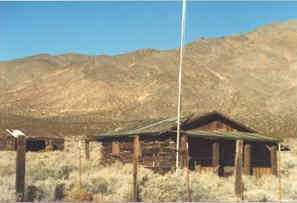 now preserved under the BLM's adopt-a-cabin program. Bonanza Gulch is a north/south tributary of Last Chance Canyon.